Caesar and Pasha have been REHOMED. Caesar & Pasha are two smashing dogs that adore each other’s company, but have more than enough love to share with everyone else too. 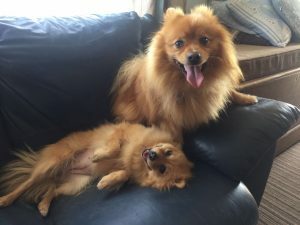 Both dogs have been very well looked after and are in excellent condition, they walk beautifully on lead, are house trained and are calm and quiet in the car and lively and playful in the home. Pasha is the slightly more outgoing of the two, demanding attention, whereas Ceasar is happy joining in or mooching about on his own. Both of them will happily settle down in a bed or a comfy lap, and they enjoy a good tummy rub. Ceasar is 5 years old, and Pasha is 2 years old, they are both neutered, microchipped, vaccinated, worm & flea treated and are being fostered in Deal, Kent.